You can send invoices using Yandex.Checkout, for instance, in emails, via text messages, and in other messengers (e.g. VK.com or Viber). The client can make the payment directly from the message. The Invoicing section in your Yandex.Checkout Merchant Profile allows you to create invoices and send them to clients using emial, text messages or messengers. The option is free of charge. 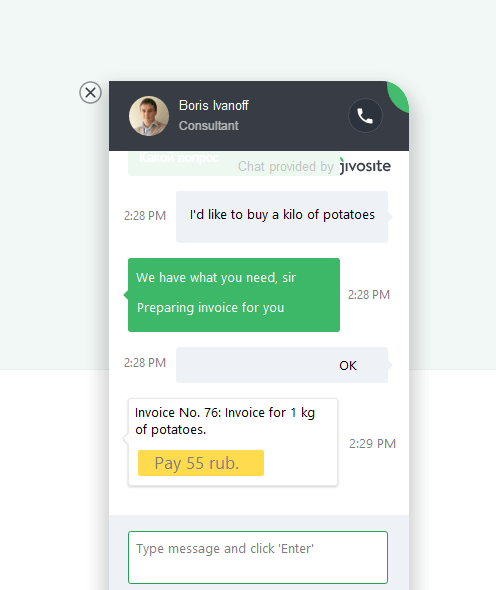 If you are connected to Jivosite (and yandex.Checkout), you can issue invoices during a chat with client. The client interacts with the support service using the Jivosite interface. The support consultant pushes Issue invoice in the chat window, specifies the products and the price, and sends the invoice to the chat. The client recieves the message containing the order description and the payment button. The user pushes Pay and lands on Yandex.Checkout's page. Then the user selects payment method and transfers money. The payment status is viewed directly in the live chat: 'awaiting payment', 'paid', and so on. The information about paying invoice is saved to your Yandex.Checkout's Merchant Profile. Write our manager that you want to issue invoices via Jivosite live chat. This feature allows sending text messages with the payment code to the Sberbank Online clients. To make a payment, the client responds with a text message containing the same code. The client consents to receiving invoices in text messages at the moment of accepting the users' offer (for instance, on your site). The client selects the Sberbank Online payment method on your website, or during the chat with the support consultant, or using some other way. Then they provide their phone number. The store sends to Yandex.Checkout the payment request containing the payment amount and the client's phone number. The client gets a text message from 900, a number well-known by all Sberbank Online users. This message includes the store's name, amount, and payment code. The client enters the payment code in the message of reply. The message is free of charge. A notification informing of either a successful payment or an error is sent to the client (from Sberbank Online) and the store (from Yandex.Checkout). create an offer or get the user's consent to sending invoices in text messages using other method.